CS&CSS Seal News, Quarterly Publication, 2005-2010, CD. 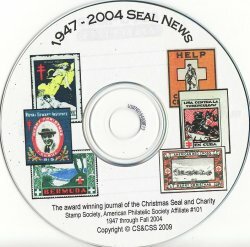 CS&CSS Seal News, 2005-2010. 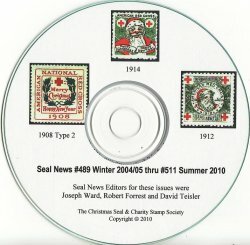 The Seal News is the official quarterly publication of the Christmas Seal & Charity Seal Society (CS&CSS). Volume #489, Spring 2005 thru Volume #511, Fall 2010, full color, computer CD edition, pdf files. Published by the Christmas Seal and Charity Stamp Society (CS&CSS). Catalogs are in pdf format, all images are full color, 2010.